Christ is Risen! Celebrate with music & prayer where all ages and all walks of life are welcome. Children are always welcome in church and nursery care for young children is available. Those of us who are members of a faith community are familiar with the Easter story. However, we are surrounded by people in the wider community who have never heard this story. That may seem unimaginable but, unfortunately, it is reality. Today, the only way others will know of this life-giving story and of our own experience is for us to share it. Holy Week is the perfect time for us to do this. Because it is during this week that we are invited to experience the story by remembering, once again, Jesus' journey to the cross and beyond. Holy Week is an important time in our life of faith. I pray that you will commit to attending Easter services, if possible. And invite others to join you - especially those who have never heard the story, our story, before. On Easter Day we will celebrate the resurrection of Jesus Christ at 8:00 and 10:15 am in the parish hall. There will be festive music with choir and hand-bells at both of the services as well as coffee and refreshments after the service. 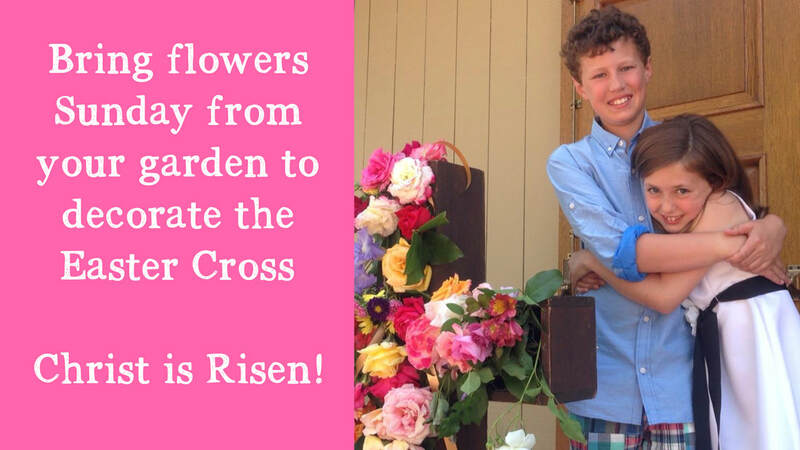 Please bring a flower to decorate the cross. At 10:00 am the children are invited to join Kimbra Ong, Director of Children and Family Ministry, in the parish hall to hear the Easter story. Following the story time the children will be led to unbury the “Alleluia” banner in time for the procession at 10:15 am. This signifies the end of Lent and the presence of the resurrected Christ. 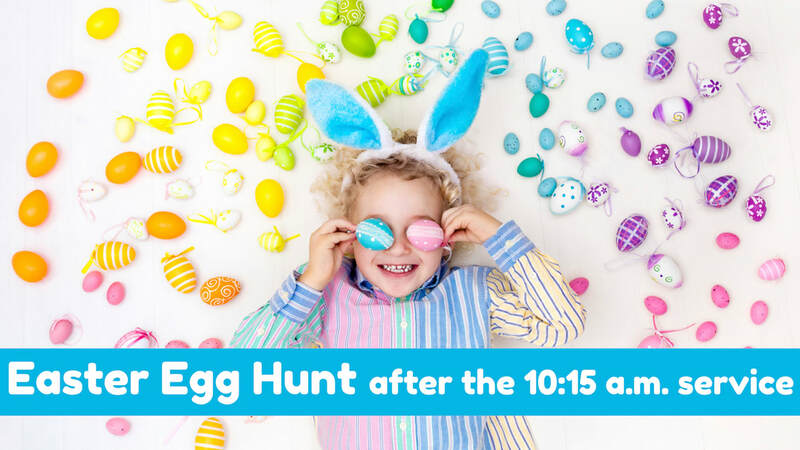 After the service (10:15 am only), the children are invited to hunt for Easter Eggs. Please have them bring their own Easter baskets. Everyone, young and old, is invited to attend any and all of the services. We will soak in the story of God's eternal love for us and soak in the spirit of Christ. Walking these days of Holy Week with our Lord, and with each other, will give new meaning to Easter when at last we will once again cry, "Alleluia. Christ is risen. The Lord is risen indeed. Alleluia." It is a joy and blessing to be with you again this Easter as rector. My thoughts and prayers will be with each of you and your families and I look forward to seeing you and those you invite to join us. ​Easter is the feast of Christ's resurrection. Faith in Jesus' resurrection on the Sunday or third day following his crucifixion is at the heart of Christian belief. Easter sets the experience of springtime next to the ancient stories of deliverance and the proclamation of the risen Christ. Following Jewish custom, the feast begins at sunset on Easter Eve with the Great Vigil of Easter. From early times Christians have observed the week before Easter as a time of special devotion. From this beginning evolved the rites we observe today on Palm Sunday, Maundy Thursday, and Good Friday. These services provide a liturgical experience of the last days of Jesus' earthly life, as well as the time and events leading up to his resurrection. Holy Week ends at sundown on the Saturday with the celebration of the Easter Vigil a unique and ancient service that opens with the lighting of the Easter fire.